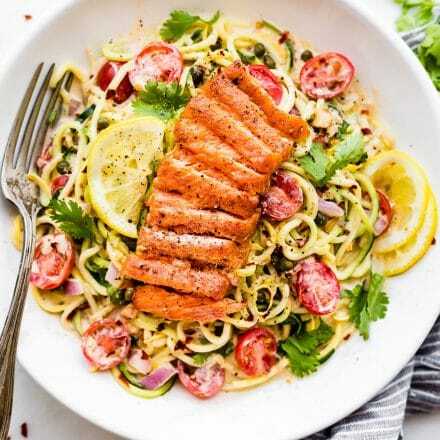 Smoked Salmon and Strawberry Zucchini Noodle Pasta Salad! 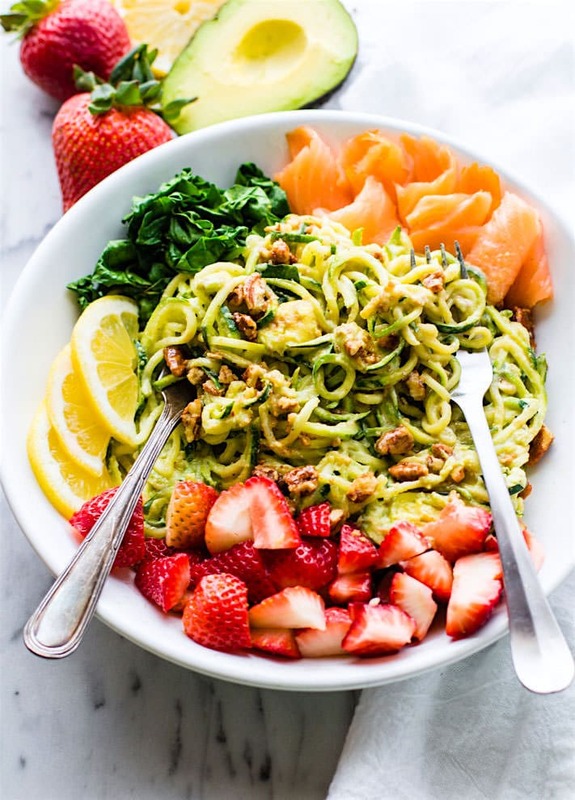 A healthy Zucchini noodle pasta salad tossed in a creamy avocado sauce with fresh strawberries, spinach, and smoked salmon. This gluten free pasta Salad is perfect for lunch or side dish. Simple light ingredients, UNREAL GOOD! There are days when I just want to be selfish. Food selfish. As a wife to a hard working man, I confess, sometimes I selfishly hide a dish or a recipe in the back of the fridge so that I can have multiple servings of it. Gasp! I know. Don’t tell him this. But it’s true! 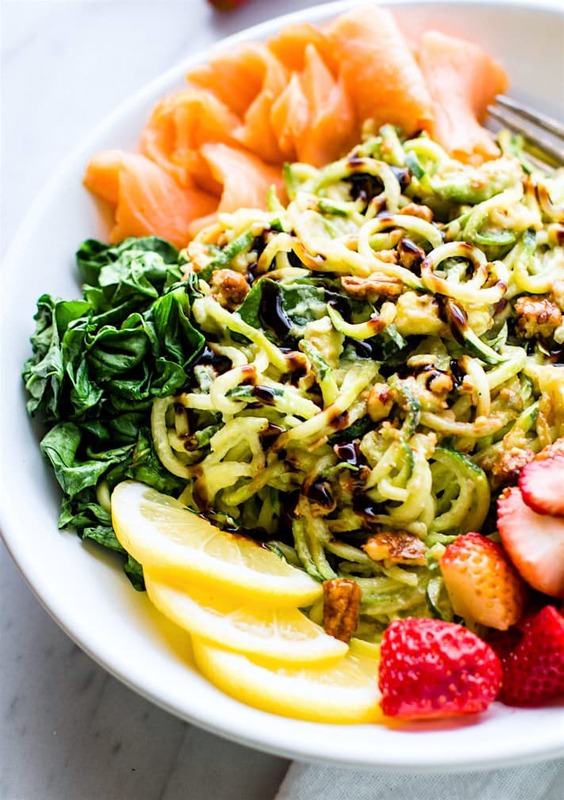 This Smoked Salmon & strawberry zucchini noodle pasta Salad is a perfect example. Hog worthy. As in HOG it ALL! As in… sorry not sorry. Then the little white lie creeps in. “Oh but you wouldn’t like it, there’s walnuts mixed in.” Mwahahahahahahaha… it’s ALL MINE! But in actuality, he would adore this zucchini noodle pasta salad. Because one, it’s low carb and he’s on a major low carb high fat kick. And two, it’s so light yet flavorful and filling and OH my goodness GOOD! Right about now you are either nodding your head agreeing with me that you do this too, or your disappointed that I didn’t share. I’m going to believe that you agree with me because let’s face it, we are human. We can be selfish at times (especially with good food). But hear me out for a moment before you start to judge. You see, I ADORE those strawberry spinach summer salads. You know, the ones that are filled with veggies, fresh strawberries, honey walnuts, goat cheese, avocado, balsamic glaze. Ya, those. Well, I also adore my spiralizer and anything spiralized veggie with sauce. Hence the zucchini noodle pasta salad part of this dish. And as you can imagine, I also adore smoked salmon. Anytime. With veggies. By itself. With fruit. I could go on and on. Bottom line —> These are my favorite foods. Not my husband’s. Not my mom’s. Not my friend’s or co-workers. These are MY favorites and I selfishly made this dish not to share (with anyone around me that is, hehe). Although it’s so worth sharing. You get my point here, right? I fully believe that life is about making and sharing what you love. I (try) to do that, YES, for sure! But at the same time, I think it’s A-OKAY to indulge in a little selfish desires. Especially when it comes down to good food, health, and overall life satisfaction. Happy wife equals happy life, right? Despite my reasoning to not share this recipe, you really should make and share it. Just maybe make a double batch. Cause it’s that good. I melted the goat cheese and ripe avocado together then mixed it into the zucchini noodle pasta. Then crumbled candied walnuts on top with balsamic glaze. All you do after that is layer some steam spinach, strawberries, and wild caught smoked salmon around it. 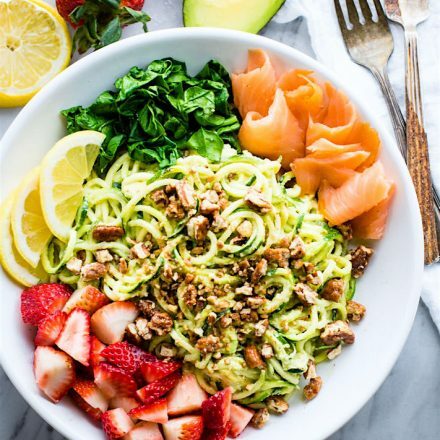 You can toss all together before serving or do what I do… twirl the zucchini noodles, scoop a strawberry, some spinach, top with a little salmon and take one massive two fisted bite. Okay, so I know I’ve rambled on forever about this Smoked Salmon Strawberry Zucchini Noodle Pasta Salad, and usually I talk about the amazing health perks of each recipe, but….. today is different. I needed to just talk foodie love. This dish is healthy, you know this. I already mentioned all the veggies and that it’s lower carb. All in all, it just screams SUMMER and RAINBOW salad! So let’s all just embrace the flavors and grab a fork instead. Mmmm k? Smoked Salmon and Strawberry Zucchini Noodle Pasta Salad! 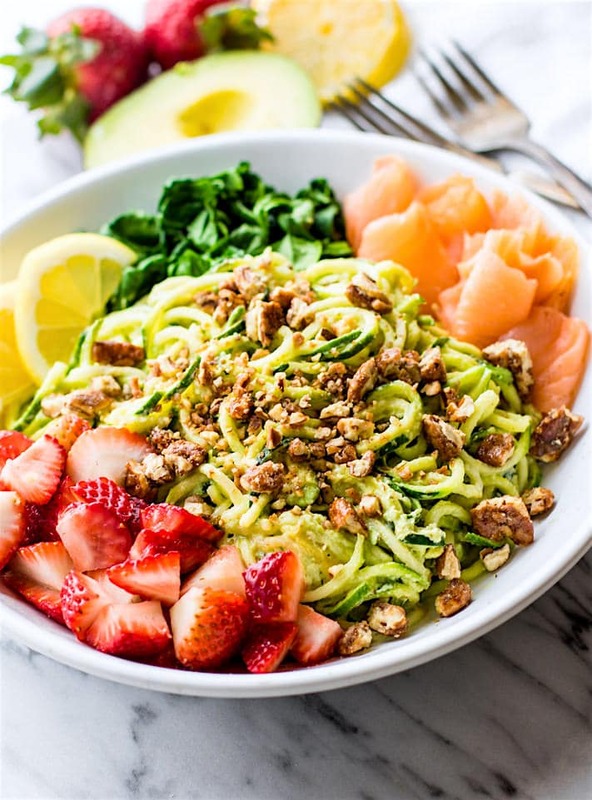 A healthy lower carb Zucchini noodle pasta salad with a creamy avocado sauce and paired with the fresh strawberries, spinach, and smoked salmon. This gluten free Salad bowl is perfect for a spring or summer lunch or side dish. First clean and wash your veggies/fruit. 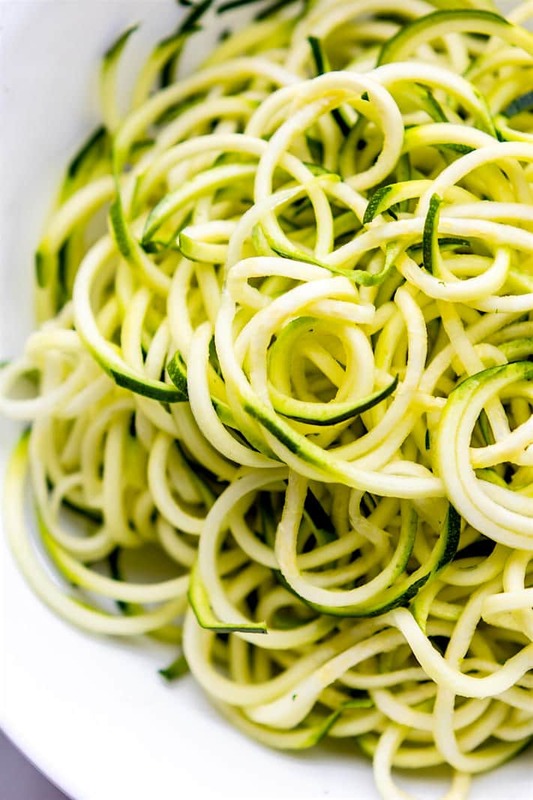 Spiralize or shave your zucchini into noodles. Set aside. In a small pot, place your avocado, oil, lemon, and cheese together. heat on medium until a cream in formed. A few minutes. Then mix in your zucchini noodles. Toss a few times to coat noodles and keep on medium to medium low for about 5 minutes or until zucchini is coated and creamy. They will be a little softer but not too soft. Remove from heat and add pepper if desired. Next chop your spinach. Keep it raw or place in microwave bowl and steam for 30 seconds to lightly steam. 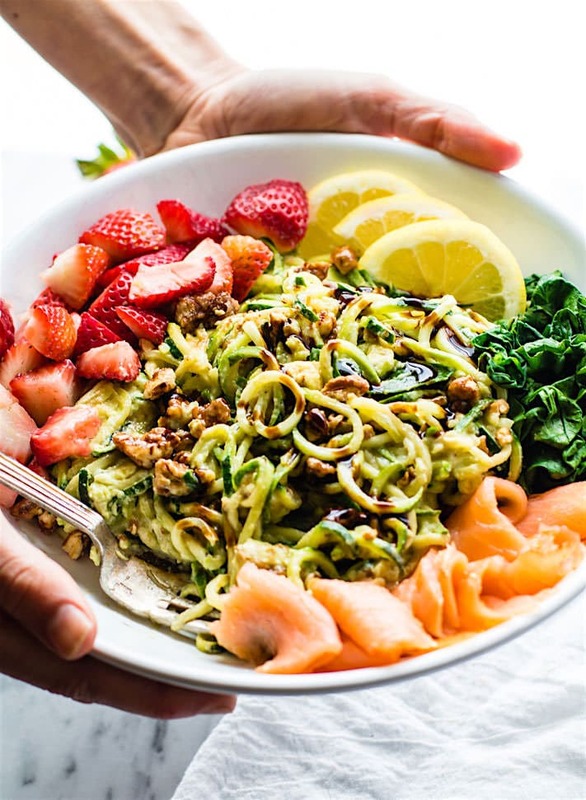 Place your zucchini noodles in a large bowl and arrange the rest of you ingredients around it. Garnish with candied nuts and add balsamic glaze if desired. Toss and serve or eat as plated. Great for two or a potluck! For dairy free option use paleo ranch or mayo in place of goat cheese. For 1 1/2 servings its around 350 Calories, 24 grams fat 5 grams saturated, 21 carbs (11 net carbs), 12 grams sugar, and 15 grams protein. 20% Iron and 150% vitamin C! Do you have a favorite food you tend not to share with others? Even your loved ones? Zucchini noodle pasta salad … favorite think to add to it? And go! Would love more ideas in the comments section. Please and thank you! 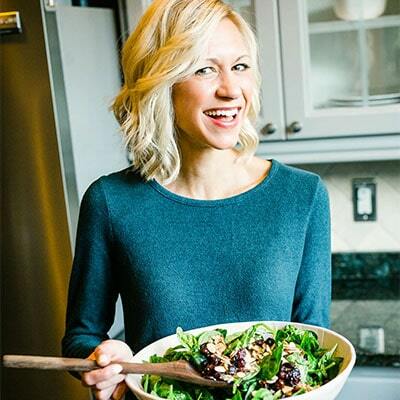 P.S –> this is the spiralizer I use and ADORE! Hands down. I know many have asked before. What an interesting combo of flavors! You know I love all of the things that are involved; I can’t wait to try them together! yes! and rice free. LOL! This looks so perfect! I have smoked salmon in the fridge and have been trying to figure out what to do with it. Definitely making this! This looks HEAVENLY. I’ve been adding pomegranate seeds to zoodles lately. But my favorite is just the “classic” lemon and basil. I love everything about this bowl though! OMG Love it! i gotta try with pomegranates! I can definitely see why you’d want to hoard that bowl to yourself – it looks soooo fresh and tasty! I’m definitely food selfish over my favorite dishes, too…I just pretend like they never happened – boyfriend’ll never know 😉 I’m loving all these flaves, girl! girl, glad we are food hogging twins! we must unite! LOL! Awesome pairing of ingredients. So fresh and healthy and perfect for dinner or to impress guests. LOL. haha yes! if i share it. LOL! haha i get you. Smoked salmon = HEAVEN! That photo!! omg. Would you believe me if I said I’ve never had smoked salmon? And I love salmon, too! I think it might be a texture thing..? Is it slimy? Whatever, I need to try it. Mmmm…I want this for dinner tonight!! 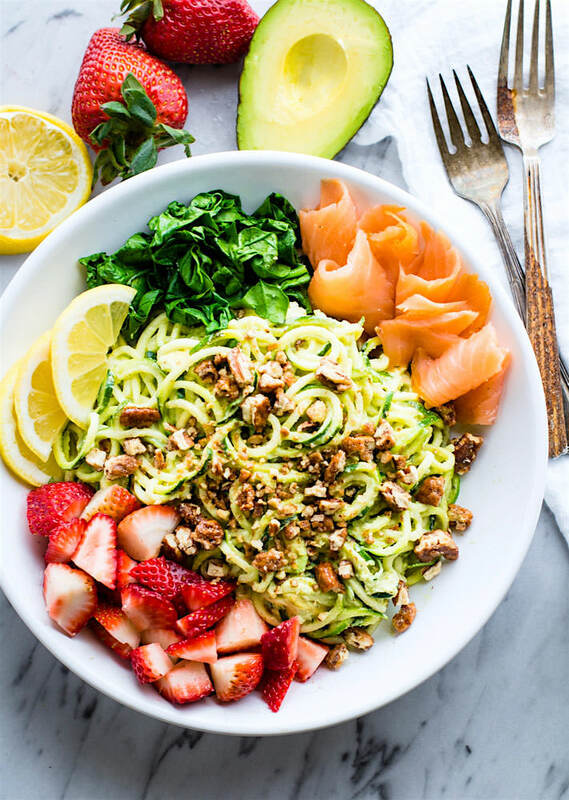 You’ve crammed some of my favorite foods into one bowl — zoodles, strawberries, and smoked salmon == DELICIOUS! This is everything I want right now. I adore smoked salmon and never would’ve thought to pair it with the sweet strawberries. It only makes sense, though, because it’s sweet + savory and that’s the BEST. Okay, so this is happening. And your photos are stunning! You put so many of my favorites in this! And considering being a jewish girl from NY it’s been entirely too long since I’ve had smoked salmon lol! This salad looks crazy good. It may be my lunch today, but with the blueberries I just bought. I love fruit with smoky fish – sweet ‘n salty! Mwahahahaha!!! YES!!! There are dishes I try to hide from my daughter – but she is like a hound dog – she can find it no matter where I put it – WTHeyyy???? If I made this and hid it, she’d have an empty bowl waiting for me when I got home! BTW ” Clean ingredients, real food, UNREAL GOOD” is a seriously insanely good tagline! Sign me up these are all my favorites too! I just bought a big container of organic strawberries and always have zucchini for spiralizing. The goat cheese and avocado mixture for the noodles… OMG!! yes! do it! you’re gonna love it sam! Ahhh this combo looks so good! I’m always looking for new ways to prepare zoodles. thanks Meg! let me know if you try it! yum! love zucchini noddles. 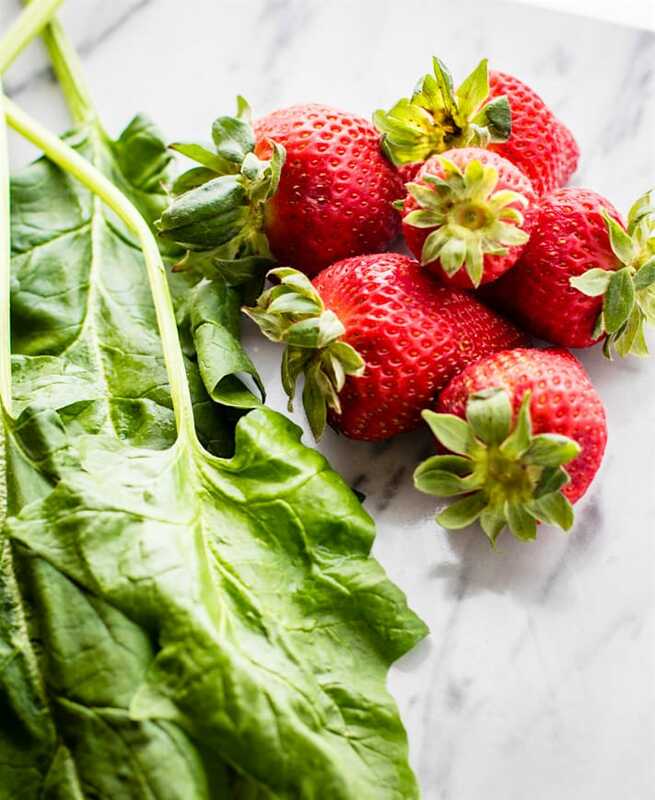 interesting idea adding strawberries – haven’t tried that before! oh i think you’d loooooove thalia! this looks amazing! I was literally just thinking about making a salmon and strawberry salad with cantaloupe today! Can’t wait to try this! i bet it’s fab with cantaloupe!! keep me posted. This is a killer combination! YUUUUUUUMMMMMMMM! Walnuts, avocado, goat cheese AND strawberries?! Sign me up! you got it! coming right up! Oh my gahhhhhd. Now you’re speaking in my language! I NEVER like to share food, especially if I bought it myself. And I blow up whenever I find out someone took a bite out of my granola or Quest bar, LOL! 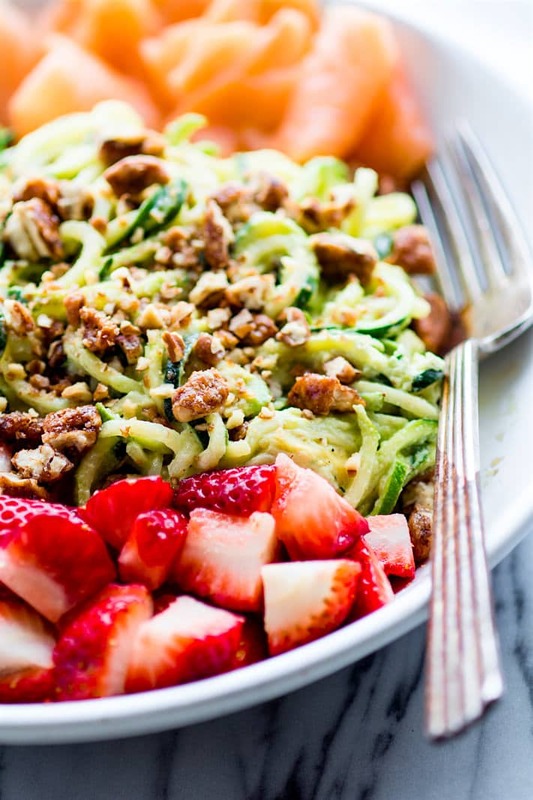 This strawberry zucchini noodle salad sounds DEEEEEEvine! Totally loving the sweet and salty blend of flavors along with the gorgeous colors on the plate! WOOHOO! let me know if you try it Cassie! I`m so LOVING this post Lindsay! The perfect summertime dinner & will be made this weekend! Thanks for the great ideas & recipes! woohoo! keep me posted on how it turns out! So ironic. I’ve been craving salmon. Not kidding! Have a great weekend Lindsay. I love meals that are bursting with color! THIS is what REAL food looks like!! Thanks friend. Yes, love that color! so good! 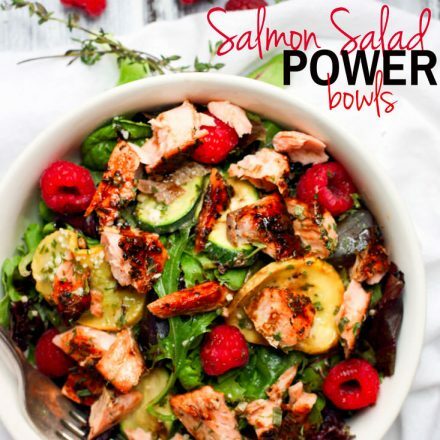 Wait Wait Wait – salmon and strawberries?! HEERRMM??! (making weird confused face and scratching my head) LOL! haha really? I have salmon in strawberry spinach salads all the time. Maybe I am weirder than you! Beautiful! 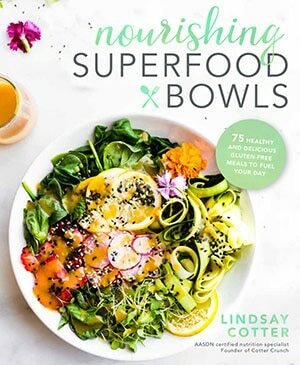 I just came to your homepage and was drooling over the many gorgeous recipes featured- your site has made such a dramatic transformation in the past year! It was always beautiful but wow! And this combo is amazing- many of my favorite foods too! I love salmon- this looks really yummy! smart! i like the way you think! This is making my mouth water! 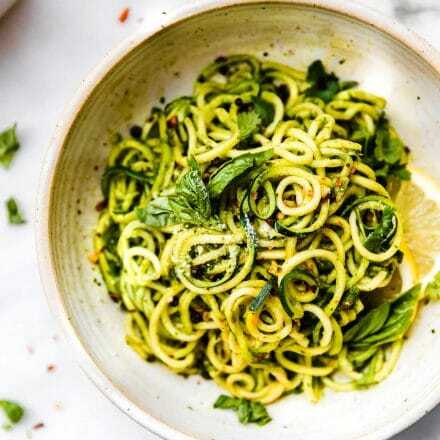 I need to get my hands on a spiralizer pronto! YOu totally do! I”m obsessed! I recently tried zoodles for the first time and man, im in love. 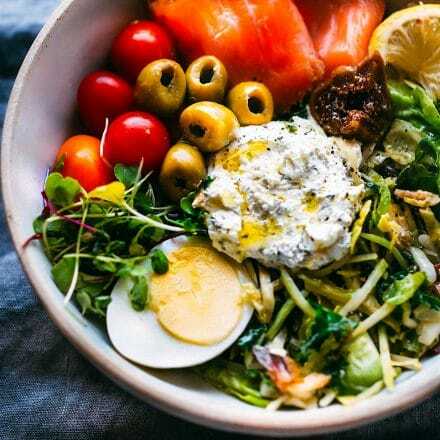 this salad is loaded full of so much healthy goodness, and i think even my husband would love it with the smoked salmon!